There aren’t a lot of restaurants in Zagreb which I feel comfortable visiting with our two kids. It’s not that I had any bad experiences; it’s my constant (perhaps irrational) fear that my kids might be disturbing the other guests. On the other hand, I can’t keep the kids locked in the house, separated from the real world. Theoretically, I could, but it’s frowned upon. They need to be walked twice a day. 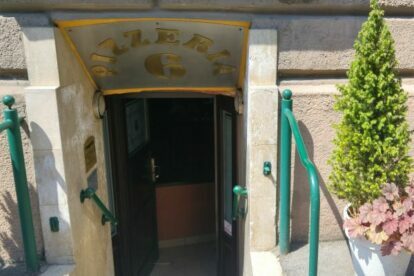 One of our “go-to” places when we have enough energy to take the kids out to eat is Pizzeria 6, close to the British square. There’s nothing special about this place. One could, in fact, argue that the opposite is true since it’s located in a basement and there’s no outdoor area. Which means, to all parents’ delight, that it’s cool and completely empty on a warm, sunny day. This is when we step in! With papers and crayons and pens and picture books and Playmobile characters and little cars and stickers! The food’s good (both pizza and pasta), the waiters tolerate our kids (some even smile and attempt conversation) and there’s beer. Pizzeria 6 makes the whole family happy and relaxed for a while – we might even smile for a selfie to prove it! If things fail to go according to the plan (or expectation), you should know that “Pizzeria 6” also delivers. Some days are better spent in front of the TV. Just saying.